Canning Vale College student Bailey Sullivan (15) with recent Italian visitor Giovanni Tebaldi . 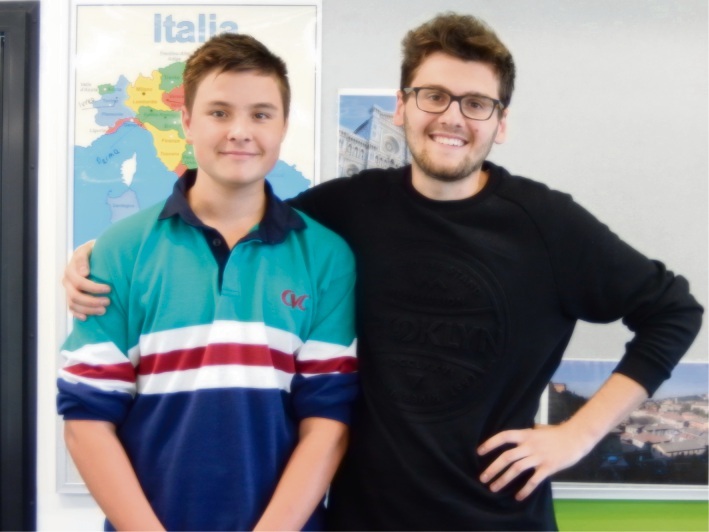 ITALIAN Giovanni Tebaldi visited Canning Vale College recently as part of a cultural exchange. The visit was part of the WA Association of Teachers of Italian language assistant program. College head of languages Esther Blood said it was important to have someone such as Mr Tebaldi, a native speaker in Italian, participate in language classes. “It helps students in the class to model the correct pronunciation and mannerisms and also giving student’s insight into current Italian culture,” she said. Mr Tebaldi found students were comfortable speaking with him because he was close in |age. “We have many of the same hobbies and interests; I only finished school about two years ago,” Mr Tebaldi said. He said Australians were more softly spoken than Italians. “Even the mannerisms are different; for example, when I get off the bus everyone says thank you, which is not common in Italy,” Mr Tebaldi said.